Art Director: Lisa Kent P ’23 Photography: Martha Delay P ’21; Lisa Kent P ’23; Judith Klein P ’95, ’00, ’04; Lauren Poussard; Kristina Young Design: Graphic Details, Inc. Check out the online version of The Tartan for additional photos and videos! HELP! 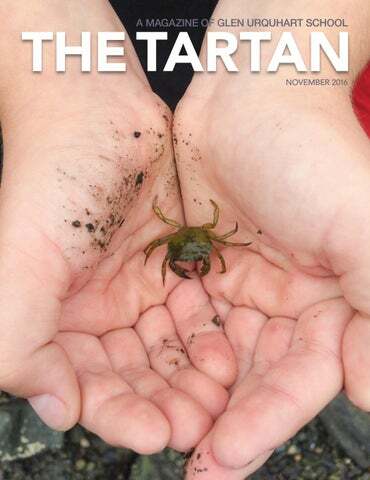 If we have sent more than one copy of The Tartan to your address or an alumnus has a new address where we should send the next Tartan, please let us know so that we can update our records. Write to Director of Advancement Martha Delay at mdelay@gus.org or call her at 978-927-1064 ext. 117. Aquarium Log Observations: Morning Temp: 70 Afternoon Temp: 64 The big crab is scuttling when the ice bottles are put in. We put in a clam and the big crab ate a lot. beach. West Beach represents a rocky shore, as does Rye Beach, where the fourth graders visited the Seacoast Science Center on their third field trip of the year. In Rye, they learned about tidal zones and how the water comes up to different levels at different areas of the rocky shore and thereby affects what animals live in various areas of the shore. Between their trips West Beach and Rye, the class visited the salt marsh at Conomo Point in Essex where they explored four zones of that ecosystem— the high marsh, the low marsh, the salt pannes, and the mudflats­—searching for different living things in each zone. With data sheets in hand, they marked what they found in each ecosystem. Returning to the classroom, they read more about the living things and played a favorite game—Four Corners—adapted to re-enforce what they had learned, with each corner of the room representing one of the four zones and each child portraying an animal. They also brought back mummichogs (tiny fish that hide) for the tank—“a new addition that is exciting,” says Laura. A shrimp has a red thing on it. The big crab ate the dead crab. The hermit crabs still are eating the clam! come in spring to talk to the students. Fourth graders will also walk on the school nature trail once a week to gain appreciation of the local watershed and consider the relationship of the land to the surrounding water. As the two new teachers anticipate integrating the theme ever more thoroughly into all disciplines and plan to introduce current topics of importance, past students and parents need not despair: the extensive study of whaling, the overnight trip to Mystic Seaport, and performing songs of the sea will not be forsaken! They are still valued and beloved traditions for GUS fourth graders. Can you do upper school problem solving? If m represents the smallest odd number that is the sum of the squares of three distinct one-digit prime numbers, and n represents the smallest even number that is the sum of the squares of three distinct one-digit prime numbers, which is larger, m or n, and by how much? The emphasis on language is paired with the use of manipulatives that allow teachers and students to demonstrate problems and solutions concretely. In the lower grades, Cuisenaire rods are utilized. The rods provide both a physical representation of quantities and operations and a common mathematical language. In the upper school, algebra tiles are introduced because they can be used to represent algebraic equations. As early as kindergarten, students learn to express mathematical problems verbally and concretely. For example, children may learn that “four increased by three” can also be expressed as “four added to three” or “the sum of four and three,” and they can then represent the problem concretely with Cuisenaire rods. This provides students with a deep understanding of the concept which they can access in order to respond to different wordings of the same problem. deeper mathematical thinkers, the first goal must be achieved. Can you do upper school problem solving? Mixture A is 30% sugar, 15% cinnamon, and the rest flour. Mixture B is ¾ sugar and ¼ flour. If we combine 2 cups of mixture A with 5 cups of Mixture B and 1 cup of flour, what percent of the resulting mixture will be flour? and do “homework” in class) created by GUS faculty. In addition, Mahesh Sharma, the director of the Center for Teaching/Learning Mathematics and an early mentor to Merelyn, recently returned to GUS to present a workshop for teachers on new teaching methods. When Maureen first started teaching mathematics at GUS, she was thrilled to develop a deeper understanding of the higher mathematics she studied in college because of the approach through language. Now, Maureen’s favorite part of her job is when she “can get a student to have an ‘aha’ moment about math. You don’t get an ‘aha’ moment when a procedure works; you get it when you’ve made a connection to mathematics, when you’ve developed an understanding of what you’re doing.” Needless to say, at GUS, those “aha” moments come pretty often. Getting Rid of the Drag Andrew Smith ’90 When Andrew Smith was in sixth grade at GUS, his friend and classmate Evan Cross gave him a copy of Car and Driver magazine. It wasn’t long before Andrew became obsessed with sports cars. One might say that Lamborghinis, Porsches, and Ferraris fueled his imagination. In fact, Andrew recalls creating multiple sixth grade projects and book reports about sports cars. Then seventh grade science teacher Marti Di Anguera took the metaphorical air out of Andrew’s tires. Fast cars did not get good fuel mileage and were bad for the environment, she told him. Initially a bit crestfallen, Andrew absorbed this information and turned his attention from Lamborghinis to the Andrew in front of a crate of TrailerTails. challenges of making technology more responsible to the planet. His interest in the environment really wasn’t something new. “Growing up, I was always very much focused on the outdoors,” he recalls. “I spent time with my family in the White Mountains and at Squam Lake in New Hampshire.” At GUS, Andrew and his friends also spent plenty of time outside. “We always went off the soccer fields and into the marshes to explore.” Graduating from Pingree School in 1994, Andrew went on to major in physics at Middlebury College because he “wanted to understand the science behind green technology—solar power, fuel cells, electric cars, etcetera.” During his college summers, he managed an electric vehicle demonstration project at the Massachusetts Division of Energy Resources, and during his junior year abroad he had an internship at the International Institute for Energy Conservation in Santiago, Chile. Andrew understood early the importance of combining business skills with environmental sustainability goals. After graduation, he took a position with a private consulting firm and did economic development work in 10 countries, spending time in Latin America, Eastern Europe and Asia. He then attended Tuck School of Business at Dartmouth College to earn an MBA, already committed to the idea of starting a green technology company. Andrew’s third grade GUS class picture: he’s one row down from top, far right! confidence to take on risks. It was a small and nurturing environment—it really was like a family—and that set a great foundation for me. I still remember a lot of my teachers from GUS. They really were memorable.” She stays in close touch with GUS friends Lexie Winslow, Kelsey Quigley, and Meredith Gendreau. Cassie at NASA’s Marshall Space Flight Center. children’s education, it is to replicate the experience I had at GUS—which means searching for a school like GUS or moving back to the North Shore.” Since Andrew and his wife, Emily, and their three small children, Ryan (1), Lily (3), and Kyle (5), just moved from California to Chattanooga, Tennessee, GUS may prove a long commute in the near term. Andrew does, however, plan to come visit school this winter. Like so many GUS alums, he stays in touch with many of his old classmates too. So what does Andrew think about sports cars these days? “Tesla fulfills my elementary school dream! Anyone would be crazy to buy a Porsche, Lamborghini or Ferrari with Teslas now available.” For those who don’t read Car and Driver, the Tesla X SUV, which can go 0–60 in 3.2 seconds and has a top speed of 155 mph, is all electricallypowered. Even GUS science teachers could approve of that! REPORT OF GIVING Plein air painting of West Beach by 4th grade student. 2015 – 2016 Honor Roll of Donors Our community is fortunate to have families who care deeply about the value and impact of a Glen Urquhart School education. We are grateful for the many ways families and individuals have participated in and enriched the life of the school: from engaging in volunteer opportunities both on and off campus to supporting our kids and programs and holding leadership positions on the board of trustees and the parents’ association. Your efforts and generosity are always inspiring! ENDOWED FUNDS GUS Endowment, a perpetual source of support, is essential in sustaining the school’s mission. Each year, a portion of the endowment is paid out as an annual distribution to support the school’s budget. Any appreciation is retained in the endowment so it can grow and bolster the school in all kinds of economic weather. THE NORTHRUP-WARREN NATURE FUND Named after founding students Molly Northrup ’86 and Lisl Warren ’86, this fund endows the study, interpretation, and preservation of the natural resources located on the Glen Urqhuart campus. Established in 1999, this fund is dedicated to the memory of a loving parent who expressed a strong desire and commitment to enhance science education for GUS students. GAIN@GUS SCHOLARSHIP FUND The GAIN@GUS Scholarship Fund supports the summer program’s commitment to enroll a percentage of qualified GAIN@ GUS students in Glen Urquhart School. 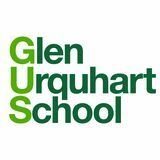 This scholarship provides tuition for an eligible GAIN@GUS student to attend Glen Urquhart for grades six through eight. Now that Chris, Laura, Henry and Anne have moved to Beverly, the couple feels more a part of the community, they say. “Last year, the kids in class were talking about Captain Dusty’s, going to Lynch Park, and skating at the Roller Palace,” Chris explains. “Now I know what they are talking about.” So keep an eye out for the young family exploring the neighborhood. And how is it working together again? “It’s great so far,” says Laura, especially since they love being at a school that brings to life their educational philosophy and goals. For hundreds of little children over nearly 30 years, kindergarten teacher Sandy Thoms has been the port of entry to GUS, guiding them into the community of learning, thinking, caring, and growing that defines our school. Over the years, Sandy has worked with a number of co-teachers, mentoring many new educators. Since 2008, she and co-teacher Amy Billings have forged a partnership that brings to life their mutual goals for GUS kindergarteners. To be a student in their classroom is to know you are valued and trusted, but that you are also expected to try hard and be nice; that you should express your own opinions, but you must listen to those of others; that you should have fun and be silly, but you must be respectful and serious too. To all of Sandyâ&#x20AC;&#x2122;s colleagues and parents of students, Sandy is a master teacher with a gentle touch that belies her strong influence and impact on the children in her class. setting; experience skills work and experimentation in the various disciplines, as compatible with their levels of development and expertise; begin to gain mastery over the tasks they struggle with; and begin to understand themselves as learners. intentional opportunities for literacy experiences are integrated across all disciplines. First, we do a careful assessment of each child’s place on the literacy continuum. Some students enter kindergarten near the beginning of this continuum; others are already reading fluently. Through this intimate knowledge of each child’s learning profile, we can focus on areas of strength as well as areas that need support, and guide children toward their individual reading goals. Do you really teach probability and statistics in kindergarten??? let’s take the long view. Who do we want these children to be as graduates of GUS, as high school and college grads, as adults? I am privileged to help children begin their educational journey at GUS and see who they become further down the road. We want our graduates to be competent, skilled, generous, thoughtful, engaged people who have integrity, people who continue to learn and grow. That is what I have in mind when I think about what is important in kindergarten. Remember Medieval Morning at GUS? There is so much happening on campus and off this year! Be sure to visit gus.org to see whatâ&#x20AC;&#x2122;s new. Then stop by for a visit. Our doors are always open!